I hold the title Senior Lecturer in Higher Education, Comparative and International Education, and Training and Development at the University of New England, where I also serve as Deputy Head of School. I have also worked as faculty director of an overseas university branch campus in China, director of international development for the first Prime Minister library in Australia (The John Curtin Centre), and study abroad coordinator, overseas opportunities coordinator, and principal/head teacher in the United States. My research has been published widely and supported by a number of international organisations, multilateral agencies and associations. Currently, I serve as Secretary-General of GlobalCIE, but I have also served as Secretary-General of the World Comparative Education Societies (WCCES), UNESCO Fellow, UNE Council member (Board of Trustees), President of the Australian and New Zealand and Comparative and International Education Society (ANZCIES), and Editor-in-Chief of the International Education Journal: Comparative Perspectives. Over the years, I have held visiting professorships overseas at Hiroshima University, Minzu University of China, and Beijing Normal University and have studied overseas in Austria and Germany. My experience in serving in associations such as GlobalCIE, WCCES, and ANZCIES has helped broaden my expertise as scholar and practitioner in comparative and international education. It has sharpened my knowledge on current theories and practice, opened doors worldwide in terms of understanding pertinent issues in the ‘twin’ fields (comparative and international education), and helped me recognise and appreciate colleagues who have mentored and advised me worldwide. While I continue to contend that education is the great equaliser in the world, it is important to affirm what I consider to be the founding principles of the field: the need to not only promote education in all its various forms but to advance it. For UNE and the associations I serve, I hope to serve as a voice that recognises and advocates the purposes and values they serve in meeting educational objectives and that the processes and goals they identify with are not taken for granted in any way. Vi Hoang Dang, PhD (2017). Vocational Education Training in Vietnam. Perceptions and improvement of image. Orestis Valianatos, ProfDoc (2017). Climate Change and Resource Efficiency: A platform for organisational innovation and leadership. Anthony Fenton, PhD (2016). Organisational Change at a Japanese University Sub-organisation. Samir Al-Balas, PhD (2015). Leadership in the Jordanian Ministry of Health. Jim White, EdD (2013). The Role of the Principal in Improving School Image: Creating a professional development program to assist school principals in formulating strategies to improve school image. Suter, Larry, Emma Stone, & Brian D. Denman, eds., (2018). The SAGE Handbook of Comparative Studies in Education. Sage Publications Ltd, London. Denman, Brian D., (2018). "Critical challenges in approaches and experiences in comparative education research". In The SAGE Handbook of Comparative Studies in Education. Sage Publications Ltd, London. Brown, Natalie, Carina Bossu and Denman, Brian D., (2018). “Concepts, Practice and Representation in Higher Education: Trends and objectives”. In University Development and Administration. Professional and Support Staff in Higher Education. Carina Bossu and Natalie Brown, eds. Springer Nature, Singapore. Denman, Brian D., Yumiko Hada, Qiang Liu, and David Turner (2018). “International Connections: Personal stories and cultural contexts in university partnerships”. In Exploring Consensual Leadership in Higher Education: Co-operation, collaboration and partnership. Lynne Gornall, Brychan Thomas, Lucy Sweetman, eds., Perspectives on Leadership in Higher Education Series, Bloomsbury Publishing, London, United Kingdom. Denman, Brian D., (2016). “Globalization and the Imagined ‘Global Thinker’. In Advocacy for Change in Educational Culture, Dale H. Eberwein, ed., Education in a Competitive and Globalizing World, NOVA Science Publishers, Hauppauge, New York (2016-1st Quarter): 1-18. 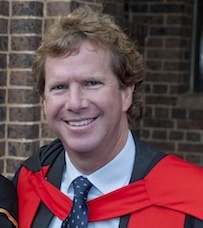 Denman, Brian D., (2016). “Metaphorical Trajectories of Comparative and International Education Research in the Asia-Pacific”. In Annual Review of Comparative and International Education 2015 International Perspectives on Education and Society, Vol 28. Alexander W. Wiseman & Emily Anderson, eds., Emerald Group Publishing Limited, Bingly, United Kingdom: 97-106. Denman, Brian D. (2018). “World-Class or World-Ranked Universities? Performativity and Nobel Laureates in Peace and Literature”. In Nordic Journal in Comparative and International Education, Heidi Biseth and Halla Holmarsdottir, Eds. Denman, Brian D., (2017). “Post-Worldview? A dialogic meta-narrative analysis of North-South, South-South, and Southern Theory”. In International Journal of Comparative Education and Development, Vol 19, No 2/3 Emerald Group Publishing, Bingley, UK: 65-77. Denman, Brian D., & Rosalind James, (2016). “Cultural ecology and isomorphism applied to educational planning in China’s Inner Mongolia: A new rubric”. In International Journal of Comparative Education and Development, Vol 18, No 1 Emerald Group Publishing, Bingley, UK: 40-52.